Born in Leggett in Edgecombe County, lifelong resident Lawrence H. Fountain was educated in the public schools of Leggett and Tarboro. 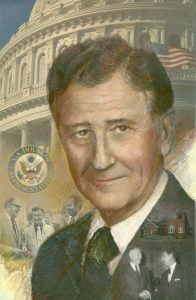 During his service in the NC Senate from 1947 to 1953 he played a major role in establishment of the NC Museum of Art. Fountain practiced law with the firm of Fountain, Fountain, Bridges, & Horton until his 1952 election to the U. S. Congress where he served for 30 years, becoming known as the “Watchdog” of taxpayer dollars in the US Congress.